Spent some time today on #13 ditch natural area. Work needed to be completed before the thaw came out of the ground. Sometimes you get s little to close to the wet area and get stuck. Course will remain closed through Saturday but will open for play on Sunday January 21st. Driving range will be open Saturday and Sunday. Instead of repeating what I posted about 10 days ago, the link below will explain what will take place in evaluating if the course will open or not this week as the weather warms. Well, it won't be a stampede but I'm sure there are a number of minds out there thinking 50's in the middle of next week, lets play some golf!! 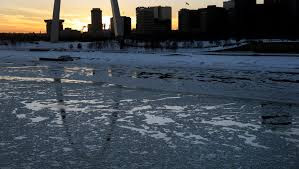 Not so fast my frozen St. Louisans. Throughout my time at Glen Echo, I've been pretty tolerant with winter play, especially on frozen greens. It's when our greens begin to thaw that the stop sign will usually come out of my pocket. We place two holes in every green in winter to help with spreading wear out if greens remain frozen. There are occasions where play is allowed out on frozen greens.There are also times when the greens for the most part remain unfrozen and we don't have to worry much about freezing/thawing cycles. The winter of 2018 is definitely a frozen year! This past fall and early winter we've had significant drought conditions which have not allowed the roots to grow properly. The fall and early winter are the 2nd best time of year for shoot (top growth) and root growth of cool season grass(Bentgrass) on our greens. This season, some of the root mass has been reduced because of drier than normal conditions. As you can see illustrated in the picture below, the late winter and spring are the prime time for root and shoot (top growth) so there is plenty of time for recovery as long as we don't create additional injury in winter. Cycle of growth in cool season turf. (shoot) top growth and root growth balance for the time of year . Pic credit Milorganite. As greens begin to thaw in the profile, there is a thawed layer and then frozen. As golfers walk on the green surface, the surface moves under their feet and roots are torn or sheared off at the interval of thawed and frozen turf. The deeper the thaw goes into the turf, the less susceptible the turf is to this issue. Another thing that happens is that the moisture that has built up on or near the surface needs to drain through the canopy. Our sand layer is approximately 6" deep. If the deeper area 4-6" deep is still frozen, water cannot evacuate from the surface area creating a significant sponge effect on the surface of the greens. High moisture on or near the surface leads to foot imprinting which can be very disruptive and noticeable for weeks. All of the above is dependent upon how slowly/quickly the freeze comes out of the greens. It varies during every freeze/thaw cycle. We will check the greens daily and notify the pro shop of availability of play or no play. One of the things you could do if the course is not open is to come out and hit a few range balls to get some swings in. With the potential of freezing rain and an ice layer forming on the greens, we might not get an opportunity during this thawing cycle to open for play. Since everyone is talking about weather, lets look at our stats for November/December. Dry weather came back again in November/December. Average temperatures for December took a big hit the last 6 days of the month with the current cold that has set in. Most of our greens have some snow cover on them which helps to insulate from drying below zero winds. Not overly concerned about these below 0 temperatures, Guessing we will get some bug populations knocked back a bit, will definitely hurt some bermuda and might significantly weaken some poa annua. Bentgrass handles this type of cold pretty well. HIGH TEMPERATURE RECORD TIED (74 DEGREES ON 11/24. ALSO SET IN 1966). SNOWFALL RECORD TIED (TRACE ON 11/01. ALSO SET IN 1991). 14TH DRIEST DECEMBER ON RECORD (0.84 INCHES OF PRECIPITATION).